On August 25, 2006, the International Astronomical Union (IAU) took a deciding vote on the fate of Pluto as a planet. That day, Pluto was demoted from being the ninth planet in our solar system to “dwarf planet”. But as it happens, Pluto's fate was inextricably linked to an object 3% bigger than Pluto which was discovered by Dr. Mike Brown et al. in the trans-Neptunian region known as the Kuiper belt, of which until then, Pluto was the largest inhabitant. The Kuiper belt was discovered in 1992. By 1997, almost a hundred bodies had been found. Suddenly the study of those objects located beyond Neptune became a hot field in astronomy. Dr. Mike Brown's search for a planet beyond Pluto started around that time, using, initially, the 48-inch Schmidt telescope at Palomar Observatory in Pasadena, California. His survey of the sky took two years and didn't yield the desired result. He refers to that time as follows: “...I talked to my friends about planets. I thought about names for new planets. I gave lectures about the possibility of new planets. I did everything I could, except finding new planets.” By 1999, about 500 bodies in the Kuiper belt were known. After three years of systematically surveying the sky and writing computer code to process the images in the computer, the searching had amounted to nothing, but by mid 2001, the photographic plates of the 48-inch Schmidt telescope at Palomar Observatory were replaced by a modern digital camera that was able to detect fainter things in the sky. Within months, Dr. Brown's graduate student started finding things. In June 2002, they found an unusually bright wandering object which they nicknamed “Object X”. Years later, a graduate student of Dr. Brown would speculate that as Titan, Pluto and most of the objects in the Kuiper belt “had formed with methane, but the gravitational pull of Object X [being so small] was not quite strong enough to hold on to the methane forever. With the Keck telescope...the last remnants of frost on a cold dying world [had been observed].” “Object X” ended up being half the size of Pluto, and was formally named Quaoar. In the fall of 2003, the small telescope at Palomar was fitted with a new super camera. Dr. Brown, suddenly working on his own again, refined the computer software and discarded 10% of the sky in the pictures to get rid of camera flubs. As potentially golden images became more manageable, Dr. Brown began to find more unusually bright wandering objects. Nothing significant, but it was a step in the right direction. In November 2003, he found a faint object that moved at half the speed of anything he had ever seen. Something more than three times the distance of Pluto, with an extremely elongated orbit—it takes 11,000 years to go around the sun—, beyond anything seen thus far in the solar system. The object was nicknamed The Flying Dutchman, as the ship of folklore. Dr. Brown theorized that Dutch could have acquired its odd orbit at the birth of the sun 4.5 billion years ago when stars just like ours populated the sky, which “could have pushed Dutch around and put it exactly where it is now...Dutch was not just a chunk of ice and rock at the edge of the solar system. It was a fossil left over from the birth of the sun.” Dutch was officially named Sedna, after the goddess of the sea in Inuit mythology. Sedna was found to be three-quarters the size of Pluto. Two days after Christmas in 2004, Dr. Brown observed his brightest wandering object yet. He nicknamed it Santa in honor of the season. Its orbit was elliptical and tilted, as objects in the Kuiper Belt have. After a lot of controversy about its actual time, place, and team of discovery, it was officially named Haumea after the Hawaiian goddess of childbirth, a suitable name since “many objects in the outer solar system can now be traced back to having originally been part of the surface of this object.” It has been theorized that “early in the history of the solar system, a much larger Haumea was smashed by another icy object in the Kuiper belt travelling at something like ten thousand miles per hour...The glancing blow left Haumea spinning faster than anything else in the solar system.” Its two moons, chunks of Haumea, were named Hi'iaka and Namaka. Haumea is covered in pure ice and is smaller than Pluto. It weighs one-third as much as Pluto and its moon Hi'iaka goes around it every forty-nine days. In April 2004, Dr. Brown found yet another wandering object, brighter than any of the previous two. He nicknamed it Easterbunny. As Xena’s, its surface is like Pluto's, “covered with large amounts of almost pure methane ice, a consequence of the fact that it is just a little smaller than Pluto and lacks enough gravity to hold a substantial nitrogen atmosphere.” Its official name became Makemake, after the fertility god of the island of Rapa Nui (Easter Island). 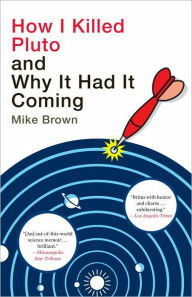 Why I Killed Pluto and Why It Had It Coming by Mike Brown is for the most part a science memoir of almost a decade long search for trans-Neptunian objects of significance, now denominated “dwarf planets” (for lack of a better term). His memoir also details his initial steps in the dark as a young Caltech professor, meeting his wife-to-be, how they romanced, married, and had a daughter. Mike Brown could have come across as a pompous know-it-all because he certainly has the expertise to back it up. Instead, his memoir is candid—he admits there were times he was completely in the dark, and how, at least once, after his graduate student Chad moved on, he felt he was in over his head and wanted to quit his planet search. At once funny and page-turning, Why I Killed Pluto and Why It Had It Coming will both instruct and entertain you, and will do so in under 300 pages. Wow, that is a lot of science! I am glad you found it entertaining as well as instructional. I almost always find memoirs to be good reading. It sounds more science-y than it was. It was a lot of fun with plenty of laugh out loud moments. It sounds interesting. Pretty catchy title too. Does he write it for a wide public audience? -- or will it be too scientific for someone like me to understand? How did you find this one? He writes for a wider audience, and the science he talks about, he explains in a down to earth manner. I think anyone would enjoy it like I did. I found it on Amazon while looking for another book; this one appeared among suggestions. This sounds really fascinating. Thanks for bringing it to my attention. To be fair it's probably not a book I'd pick up but you did a great review and I'm glad you enjoyed it. Thanks, Lynn. I know it's not everyone's cup of tea, but it's mighty entertaining.